Mastered At – Record Plant, N.Y.C. Published By – Frost Music Corp. Published By – Jonware Music Corp. Early Jacksonville pressing, green Apple with "Mfd. By Apple Records, Inc." at bottom perimeter on Side 1 only. Side 1/Side 2 text is in upper and lower case font at the left, "Stereo" is not stated on labels. 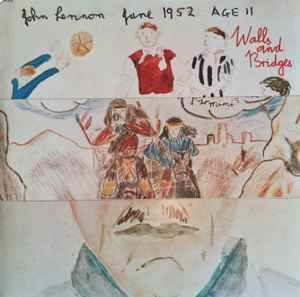 Issued with a custom gate-fold cover with two, 2-sided 4" x 12" flaps that reveal Johns childhood drawing, and can be used to flip over and create different images of John's face on the back. Also comes with custom posterboard inner sleeve with more images, and an 8-page lyrics/photo booklet. Pressed at Capitol's Jacksonville factory, as idenitifed by 0 stamped in the run-outs. Also thanks to: Pappa Dennis Ferrante, Rod, Corky, Howie, Dave, Bruce, Frankie and Uncle Tom Cobbley and all, y'all. Special thanks to Howard Johnson for his hornspiration and Steve Madaio and Bobby "Did I play that?" Keys for extra-curricular.